100 % cotton Batik and a Black Cotton Blend. filling can be removed or added later, to maintain desired firmness. Great prop for Yoga or just simply, relaxing. Studio and Restorative Yoga Essential. Cover outer-panels made of Black Cotton Blend. Cover mid-panel made of 100% Cotton Batik. approx. 27'' long x 9'' diameter. Because Bolsters are handmade, sizes may vary slightly. 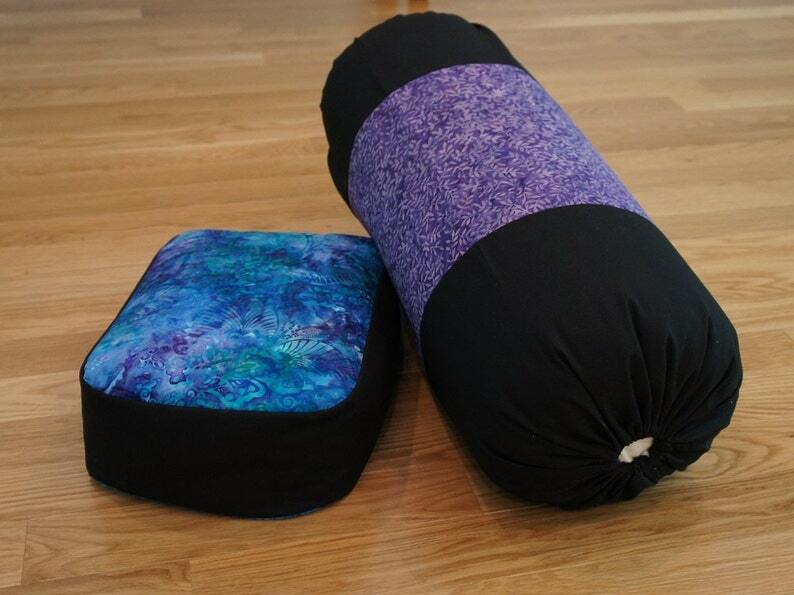 **Meditation cushion shown above in REEF MULTI (Purple and Blue tones), sold separately. To wash: Remove Cotton Bolster; wash Cushion Cover by hand in COLD water, Hang/Air dry, very LOW iron if needed. Yoga Bolster, Bhutanese-like Tibetan fabric handmade in Nepal features beautiful colors and intricate patterns. Fantastic pillows. Beautifully made and quick communication. Thank you! This is the perfect yoga pillow! Just the right size to bring with you to class and so much more versatile for me than a bolster. I accept payment through Etsy, VA state residents will be charged sales tax. Items will be shipped after payment is verified. I am happy to cancel orders and make a refund although, when you change your mind please take into account that charges are still incurred to the shop. Please take a moment and be mindful of your purchase before you press, BUY. I want you to be happy with your items. If not, please let me know as soon as you receive your order. Only unopened packaging and unused items maybe returned, although It is your responsibility to pay for Original shipping and Return shipping. Once the item is received by the shop and verified in unused condition, a refund minus Original Shipping charges will be issued to your credit card. Please e-mail if you have questions regarding any products. If items have been lost or damaged please contact me asap. On Sale Items are non returnable. Shipping is usually within 2 business days, although we like to say 3-5 just to be safe. Most items are shipped USPS, larger bulkier items (cushions and Bolsters) are shipped Fed-Ex Ground. After shipping, confirmation and tracking will e-mailed to you. Due to Bulk and Size, Bolsters can only be shipped to the lower 48. Sometimes shipping can be combined depending on the order bulk, where it is mailed and the weight. After the items are shipped and shipping fees can be verified by the shop, a refund may be issued if shipping costs, are less than anticipated by the shop. I recycle gently used boxes and packaging for shipping. Everyone's monitor may show the pictures taken in different tones, I do my best to describe the fabrics and colors, if you have any questions please e-mail me, I am here to help. *Neck, Back and Shoulder WRAP: To achieve a nice warmth: microwave for ONLY 20 seconds at a time. CAUTION! Wrap can become VERY HOT! PLEASE HEAT CAREFULLY! Everyday inspired Yoga/kbags LLC/DBD, LLC is not responsible for damage of product due to misuse. Overheating wrap may damage Fabric and/or Flax seed. To use: lay wrap flat, fold ties over middle, fold or roll wrap so that the ties are folded to the inside. Microwave for ONLY 20 SECONDS AT A TIME. CAUTION! Wrap can become VERY HOT! PLEASE HEAT RESPONSIBLY! *PETITE WRAP: To achieve a nice warmth: microwave for ONLY 20 seconds at a time. CAUTION! Wrap can become VERY HOT! PLEASE HEAT CAREFULLY! *BALL: to use: microwave only 10 seconds at a time to achieve a nice warmth. CAUTION! ball can become VERY HOT! PLEASE HEAT CAREFULLY! Everyday inspired Yoga/kbags LLC/DBD, LLC is not responsible for damage of product due to misuse. Overheating Ball may damage Fabric and/or Flax seed. Microwave for ONLY 10 SECONDS AT A TIME. CAUTION! Ball can become VERY HOT! PLEASE HEAT RESPONSIBLY! **Because All Products are handmade, sizes may vary slightly. **Products are for home/personal use only. **Products will NOT be replaced due to purchasers/buyers misuse. CARING FOR YOUR Meditation CUSHION, Neck and Back PILLOW and/or BOLSTER. To wash: Remove Buckwheat Hulls OR Cotton Muslin (Bolster); wash COVERS by hand in COLD water, Hang/Air dry, very LOW iron if needed. EYE PILLOW COVERS: Remove COVER, wash in cold water, hang/air dry and warm iron if needed. DO NOT WASH FLAX SEED EYE PILLOW. *Even though all denim is pre-washed; denim dye particles may remain on the surface and can rub off onto clothing. All Guatemalan Fabric May Bleed HAND WASH SEPARATELY.